President Trump will soon sit across the table from a man who, as of three months ago, was an enigma even to the CIA. He hadn’t left his country as leader, and his most high-profile summit was with Dennis Rodman. Not long ago we debated whether he was crazy — now there’s concern he might be too shrewd. Between the lines: Kim’s emergence onto the world stage has been swift and, thus far, remarkably successful. Once a pariah, he’s now being courted by foreign leaders. Commitment to maximum pressure is dwindling around the world, and even in Washington. Trump is looking for a breakthrough in Singapore. Kim has already had one. "A vague statement, big smiles, big banquet, his wife is there — charming, lovely, young — talking to Trump, and he walks away. Maybe there's another summit, maybe there's follow-up meetings, maybe there's a declaration for peace, but in any case I think it's up to Kim if he's gonna start doing nasty things again or if he's just gonna stay quiet for seven years." "I actually think the North Koreans see this as an opportunity. I think they see because Trump is so unique and different that if there ever were to be a deal made it could be made with President Trump," Terry said. Pak concurs: "He sees a South Korean president who's willing to look away from the nuclear and conventional threats. He sees a U.S. president who is really eager to meet with him and wants to prove his international standing as a peacemaker, and who is also very much interested in potentially withdrawing U.S. troops in the Korean Peninsula." But with Mike Pompeo reiterating the U.S. position today that nothing short of "complete, verifiable and irreversible denuclearization" will do, can Kim really get there? "I think he's willing to sit down and negotiate. Will he, at this moment, be thinking in his head that he's going to absolutely give up his nuclear weapons program? I don't think so. That doesn't mean he won't ever... but at this moment, what he wants is just a negotiation." Michael O'Hanlon of Brookings lays out one alternative to full denuclearization the U.S. might be able to live with: North Korea becomes "Vietnam with nuclear weapons." 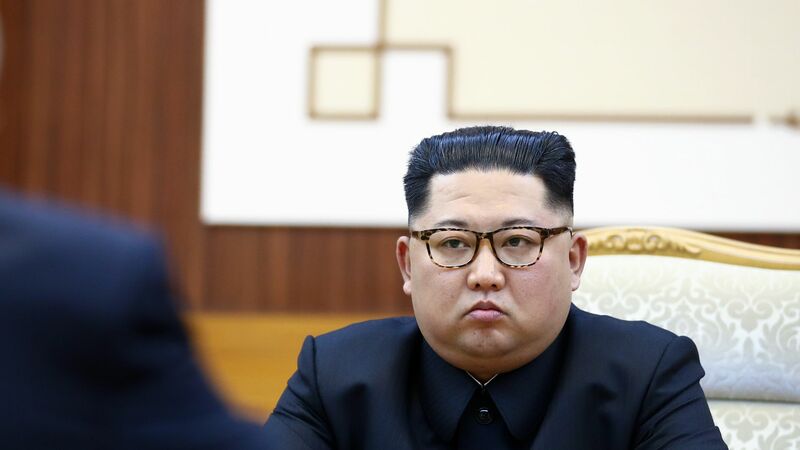 "If he's gonna be in charge of North Korea for the next fifty years — reform from within, gradually connect to the world, build up the economy, but he keeps those nuclear weapons as long into the process as he can. ... We could live with that as long as we keep our expectations in check." "North Korea has been studying the United States — solely focused on the United States for decades. So this is not something we can wing." "I think I'm very well prepared. I don’t think I have to prepare very much. This isn’t a question of preparation. It's a question of whether or not people want it to happen, and we'll know that very quickly." Ahead of the G7 summit — which begins tomorrow in Canada and which President Trump is reportedly dreading — French President Emmanuel Macron and Canadian Prime Minister Justin Trudeau held a remarkable press conference in which they criticized President Trump's entire approach to foreign policy and noted how isolated he is from the other G7 leaders. "Perhaps President Trump doesn't mind that he's being isolated today, but these six countries have shared values, we represent an economic market that has the strength of history behind it and also represents true international strength today." On tariffs, Macron said Trump's "unacceptable actions are hurting his own citizens," while Trudeau noted, "we are the closest friends the United States has had in quite some time." On dealing with Trump, Macron said, "Sometimes I've been criticized for being too friendly with President Trump. ... Can I be criticized for the decisions of another leader? No! ... I think we've done everything we can, and put everything on the line." On U.S. foreign policy: "When you're saying that President Trump doesn't really care, maybe you're right, but no one lives forever. Our countries and the commitments we make will extend beyond our lives. There is a continuity on the international level." Trump hit back on Twitter: "Please tell Prime Minister Trudeau and President Macron that they are charging the U.S. massive tariffs and create non-monetary barriers. ... Look forward to seeing them tomorrow." Financial Times (U.K.): "Donald Trump is about to make history by shaking hands with an adversary. Indeed, he will greet six of them at the same time." Le Monde (France): "Never has a G7 been so tense, against a backdrop of a trade war between the United States and its allies, a showdown over the climate and a transatlantic crisis after the U.S. withdrawal from the Iran nuclear deal. Nor has Washington been so isolated in this body." Handelsblatt (Germany): "The Americans are isolated in the face of universal condemnation from other participants for its unilateral actions, which they view as illegal under international law." Worth noting: As the head of a populist coalition, new Italian Prime Minister Giuseppe Conte is also an outlier among the G7 leaders. La Stampa envisions "a difficult debut for Conte" while Il Messaggero sums up his position: "From the classrooms of the University of Florence to the table of world leaders, in just one week." Expert Voices: The G7 summit will be contentious — for all the wrong reasons. The good news is that two-thirds of people surveyed around the world feel confident in their local police force, and safe walking in their neighborhood at night. In Latin America and the Caribbean, the worst performing region, those numbers tend to be far lower. Just 17% of Venezuelans feel safe at night, 42% said they'd been the victim of theft in the past year, and 24% said they'd been assaulted. The latest battle has been over the legal wording of a "backstop" trade deal after the U.K. leaves the EU. Conservatives pushing for a hard Brexit want that backstop time-limited, fearing that May's preferred option of an indefinite solution could leave the U.K. permanently attached to Europe. Once again, the issue centers on the border between Northern Ireland (a constituent of the U.K.) and Ireland. The backstop is needed to prevent a hard border between them. The latest: May and Brexit Secretary David Davis have publicly faced off over the last day on the issue — with rumors bubbling that Davis may resign — but ultimately released a backstop proposal this morning with a December 2021 end date. That led Brexiteers to declare victory, and claim May had backed down. However, the proposal is riddled with couched language surrounding the time limit. As a result, the EU might just accept it. 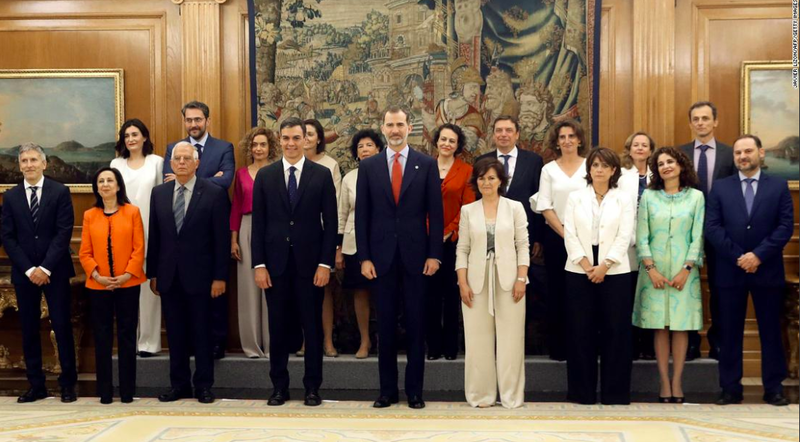 Spain's new Socialist prime minister Pedro Sanchez has unveiled a cabinet in which 11 of 17 members are women — the highest proportion in European history, per CBC. Among the cabinet members are a former astronaut, a novelist, an openly gay former judge and Spain's top anti-terror prosecutor, per the BBC. Sanchez will have to cobble together support from a number of parties to govern after ousting Mariano Rajoy last Friday. Earlier this spring, Turkish President Recep Tayyip Erdogan made a big bet. Moving up his country’s general elections by 16 months to June 24, he reasoned, would make it easier to lock in a fresh mandate before a slowing economy and growing opposition complicated things. That may have been a riskier move than he thought, Alex Kliment writes in the latest Signal newsletter. For one thing, Erdogan’s policies have recently thrown the Turkish currency into a tailspin that has raised questions about his ability to continue delivering economic growth. At the same time, Turkey’s beleaguered opposition has been surprisingly unified. The leading presidential challengers — the fiery nationalist Meral Aksener and Muharrem Ince, a largely secular politician of humble origins who has made inroads with Erdogan’s base — have pledged to support each other if either makes it to a second round against Erdogan. The bigger picture: Given his broad influence over the media and the courts, Erdogan and his AKP party are still the electoral favorites. But over the past year, there have been several cases when world leaders tried to time elections to their advantage, only to see things blow up in their faces. Just ask Malaysia’s Najib Razak, Britain’s Theresa May, and Italy’s Matteo Renzi. Ethiopia says it will accept a peace agreement with Eritrea and bring an end to a deadly conflict between the two neighbors. Ethiopia’s new prime minister, Abiy Ahmed, has positioned himself as a reformer and vowed to achieve peace with Eritrea which, as the BBC notes, "remains on a war footing, demanding that Ethiopia withdraws from the 'occupied territory.'" The backstory, per the New York Times: "the countries fought a war from 1998 to 2000 over their border dispute, which left about 80,000 people dead. They signed a peace agreement in 2000, but the Ethiopians never accepted the findings of a boundary commission established by the agreement." Go deeper: The world's fastest growing economy, in one of its poorest nations. 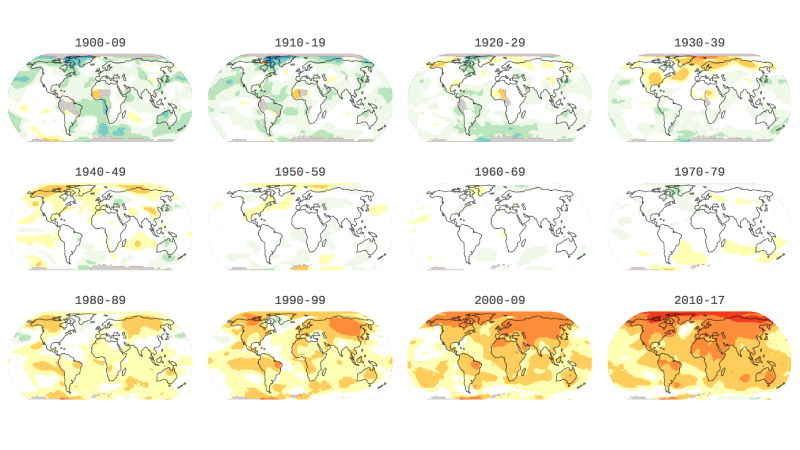 Mapped: Global temperatures since 1880. State Dept. investigates "health incidents" in Cuba and China. Why our tech battles with China are so complicated. Former intel officer charged with attempting to spy for China. In pictures: Guatemala's Fuego Volcano eruption. Report: Amazon commits $2 billion to Indian market. The global space race goes private.